（Prince George Citizen,　August 21, 2016）　All week at the Ramada World Baseball Challenge, it seemed like Team Japan was in a different league than the other four teams involved in the tournament. The boys from Japan steamrolled their opponents, outscoring them a combined 65-24 in their first six games, all of them convincing wins. In Saturday’s gold-medal final, the Roswell Invaders of New Mexico abruptly leveled the playing field. The Invaders came up with their best game of the week, pushing Japan to the limit in a thrilling finale at Citizen Field decided by a bases-loaded pitch that got away from Invaders catcher Jim Smith in the bottom of the ninth inning. 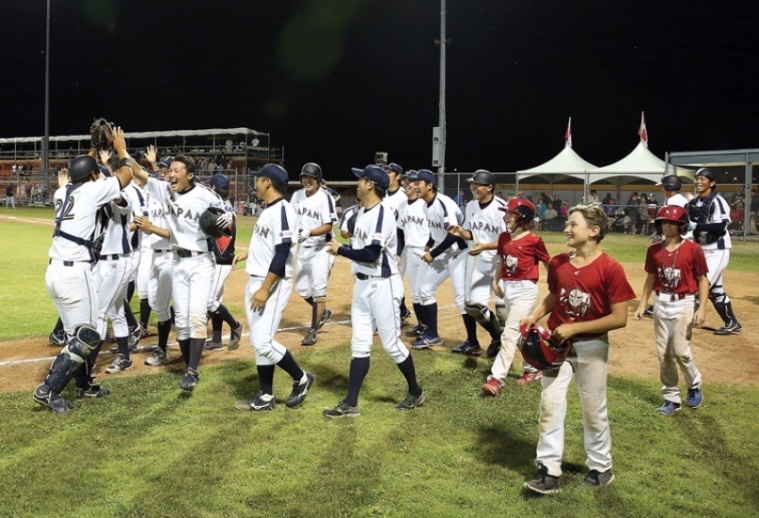 While Smith scrambled to retrieve the ball behind home plate, Toshiyuki Hayashi ran in with the winning run in a 5-4 decision, in front of about 500 witnesses who got treated to a memorable, action-packed championship game. “That was very exciting, that American team is very strong," said 32-year-old Japan captain Kimio Watanabe, speaking through interpreter Kumi Tam. “We have lots of young guys on this team and it was very important for those young guys to play in an international tournament in another country. Hayashi put the pressure on Roswell with a one-out double in the ninth and Roswell pitcher Tyler Stirewald walked Takumi Harada and Takumi Oshiro, bringing Shoji Kitamura to the plate with two out. Stirewald was one strike away from forcing extra innings when he threw a slider at Kitamura. The ball skipped off the catcher’s glove and it was all over. A dejected Smith stayed down on the turf in front of the backstop and in a show of sportsmanship, Kitamura came over to console him with a pat on the back before joining his celebrating teammates. Inspired by a third-inning diving catch from Brett Balkan, who robbed Hayashi of a run-scoring hit into left field to end the third inning, the Invaders got to Japan starter Taisuke Yamaoka, countering with four runs in the fourth inning to take a 4-2 lead. Until that point, Japan had only trailed once in seven tournament games. With two out, Nate Ferrell, who came in to replace an injured Joey Miller in the third inning, collected the first hit of the game off Yamaoka. Bobby Webb followed with a double off the centre field wall to score Ferrell. Kaohu Gaspar then cranked the ball into shallow right field and Webb came home, barely avoiding the tag. That brought Smith to the plate and he blasted a two-run shot over the centre field wall. Japan made it a one-run game in the bottom of the sixth as a result of an error. Tatsuya Maruko doubled off the wall and the next batter, Takeshi Kunimoto, drove a liner right back at pitcher Darrel Thompson, who got his glove up just in time to protect his face. The ball bounced to second baseman Morgan Blatnik and his throw to first base was high, and Maruko scored easily. In the bottom of the eighth, Eric Gleese, who took over from Thompson in the sixth inning, hit Takeshi Kunimoto with a pitch, and Kunimoto was replaced on first base by pinch-runner Sosuke Genda. Genda stole second, and Kitamura walked. That brought up Shunta Tanaka, who singled through the gap between first and second to bring in Genda with the tying run. Closer Katsutoshi Satake took over in the ninth and Gaspar welcomed him with a flare into left field that bounced off the wall. Gaspar tried to stretch it into a double but was out at second after a perfect throw from Hayashi. Satake then struck out Smith and Gavin Lavallee, setting the stage for the dramatic ending. “We went pitch for pitch with them the entire way and they came out on top,” said Smith, 24, a native of Hatfield, Pa. “One pitch ended up winning it. You can’t ever take any lead for granted against these guys, they know what they’re doing, they’re professionals. Japan set the tone early in the tournament, getting out to quick starts and it was no different Saturday. They scored two runs on four hits in the first inning. Leadoff hitter Tanaka doubled, Watanabe singled and heavy-hitter Takuma Hasegawa knocked out a base hit to score Tanaka with the first run. Hayashi’s base hit scored Hasegawa. The Invaders made a base-running blunder in the eighth inning which may have cost them a run. Junichi Katayama came in to pitch the eighth and struck out Cody Bishop, then plunked Cody Coffman. Nate Farrell advanced Coffman to scoring position with a single and that set the stage for Webb, who launched a high fly deep to centre field, which was caught by the fielder Hasegawa. Hasegawa alertly threw to second and Farrell was a full metre off the bag and was tagged for the third out. Team Japan was an all-star squad from the Japanese Industrial League handpicked for the trip to Prince George by manager Tsuyoshi Ando. The average age of the team is 23. “I went to all the games and watched them play so when they got together they knew their roles with the team,” said Ando. “I just wanted them to do their best and play the way they normally play.